Nun and Kiwi pop in general. I was 21 years old and working a terrible job, my first right out of college. I was a retail store errand girl for the most part, going on daily trips to the grocery store to buy cleaning supplies in the San Fernando Valley. Luckily I had a car. And a CD player. I don’t think Kaleidoscope World left that CD player for the next 10 months of employment. (I quit and went back to school…accumulating about $50,000 in debt. Not sure how that’s ever gonna get paid off. Thanks, unemployment in America.) I was instantly hooked on the weirder tracks. “Pink Frost” is a great one, and probably the most well-known, but “Dream by Dream” was the one I liked to put on repeat more than anything else. I liked that the world cared enough to say goodnight to The Chills. Plus, Martin Phillips’ voice is dreamy. Fast forward a few years. July 2010. I was now out of grad school and pretty much fucked financially (reoccurring theme). What better time to leave the US. My husband and I packed it up, said goodbye to Los Angeles, and moved to Auckland, New Zealand on a one-year visa. The mission: buy as many Flying Nun records as possible. 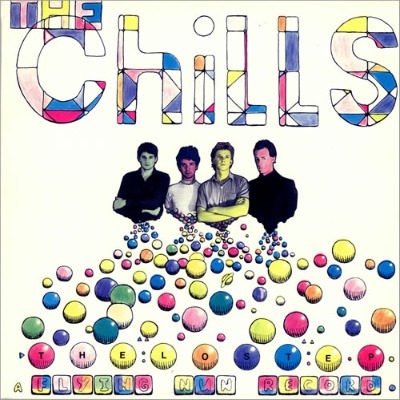 The Chills’ The Lost EP came first. Instantly attracted to the track list and the price tag (NZ$40.00 beat the NZ$99.00 asking price for Boodle Boodle Boodle—everything in New Zealand’s expensive—which I ended up acquiring by association regardless), it was only fitting. The Lost EP is comprised of six “lost” tracks which the band recorded in 1984 and 1985. The songs are subdued, minimal and harmonic, with head honcho Martin Phillips’ driving vocals at the forefront. The musicianship is impeccable, and delivers a Chris Knox/Doug Hood styled wall of sound. The album hits off with the wonderfully crafted “This is the Way,” a slower-tempo tune with a philosophical critique of the times. It picks up the pace with “Never Never Go,” a lovey-dovey pop song on which the next track “Don’t Even Know Her Name” bleeds into perfectly—false ending and all. The fun continues with “Bee Bah Bee Bah Bee Boe,” the chant of the century—gibberish. The ultimate highlight is in the EP’s last two songs, “Whole Weird World” and “Dream by Dream.” We’re shifted back into slow-tempo ambient brutality with strange lyrics and even stranger instrumentation. It all end with a goodnight wish. Appropriate and a little bit eerie, which sums up The Lost EP all too well. Get your hands on this one.